African Savannah Elephants Have Acute Spatial Memory. Study just published in the Proceedings of the Royal Society B. Authors Leo Polansky, Werner Kilian and George Wittemyer state that “…detailed ‘spatial knowledge over large scales,’ enables elephants to minimize travel distance through highly directional movement when accessing water. Polansky et al.’s research illustrates emerging approaches for studying how cognition structures animal movement behaviour in different ecological and social contexts.” In fact, “little [was] known [before this study] about the role of spatial memory in large-scale movement behavior.” Animal Spatial Memory is crucial for survival since individuals and groups must find specific resources, like water or food, in patchy environments, which change seasonally. The study was conducted in the semi-arid Etosha National Park, Namibia. Read full open access article at Elephant Spatial Memory PRSB. The main findings of the study can be summarized as follows: (1) Elephants have a remarkable spatial acuity when accessing point water sources, initiating highly directional movements to water at considerable distances from the waterhole. (2) The individuals studied [five-female- and five-male-radio-collared animals] overwhelmingly chose the nearest waterhole when moving to it in a directed manner across a range of scales, suggesting a cognitive-based mechanism for these movements. The factors leading to the cognitive decision making include: environmental spatio-temporal landscape features (e.g. distribution of ephemeral waterholes and forage resources) and social organization (distribution of conspecifics that vary in social rank). Polar Bears Are Increasingly Feeding on Bird Eggs. Climate change and the increasing impact of polar bears on bird populations. Frontiers in Ecology and Evolution. Young polar bears raid a colony of barnacle geese, searching for eggs and newly hatched goslings in the Nordenskiöldkysten region of Spitsbergen, Norway. Image by Jouke Prop. “Polar bears depend on sea ice for hunting seals. Longer ice-free seasons are hypothesized to force the bears to hunt for alternative terrestrial food, such as eggs from colonial breeding birds.” Prop et al. (a total of 16 authors) have “analyzed time-series of polar bear observations at four locations on Spitsbergen (Svalbard) and one in east Greenland.” Summer occurrence of polar bears has increased significantly since 1970/80s. “The shifts in polar bear occurrence coincides with trends for shorter sea ice seasons and less sea ice during the spring. Direct observations of nest predation show that polar bears may affect reproductive success of the barnacle goose, common eider and glaucous gull.” The authors suggest that “the increasing, earlier appearance of bears on land in summer reflects behavioral adaptations by a small segment of the population to cope with a reduced hunting range on sea ice. This exemplifies how behavioral adaptations may contribute to the cascading effects of climate change.” For complete story go to Frontiers in Ecology and Evolution. A Biotic Game Design Project for Integrated Life Science and Engineering Education. PLoS Biology. A: Biotic games enable human players to interact with cells. B: Conceptual overview of a biotic game setup. C: Students built and played biotic games. Authors Cira et al. (a total of 6 collaborators) summarize their work as follows” “we present the concept of a ‘biotic game design project’ to motivate student learning at the interface of life sciences and device engineering (as part of a cornerstone bioengineering devices course). We provide all course material and also present efforts in adapting the project’s complexity to serve other time frames, age groups, learning focuses, and budgets. Students self-reported that they found the biotic game project fun and motivating, resulting in increased effort. Hence this type of design project could generate excitement and educational impact similar to robotics and video games.” For article and materials go to PLoS Biology STEM. The authors summarize their conclusions as follows: (1) Biotic games are promising in motivating integrated, hands-on learning at the interface of life science and engineering. (2) This concept could be adapted to various age groups and learning goals with the potential for wider future impacts on education. (3) There is potential for integrating more creative and artistic aspects into STEM disciplines (Science, Technology, Engineering, Arts and Mathematics, STEAM) . Game: Test Your Spatial Memory in this easy game (Click on Image). This Pattern Memory game trains spatial recall including memory for visual patterns and location of objects. According to Memory-Improvement-Tips.com “These brain skills can help you remember where you left your keys or parked your car” (if that does not work, at least you will have fun playing the game). To begin, click the Small, Medium or Large links. This opens the game in a pop-up window. Wait for it to load, then click “START.” Good luck. Happy Saturday everyone, here are a few of my favorite news, videos and science links about topics of broad interest, enjoy! Earth’s tectonic plates skitter about, from Science Magazine. Liftoff! US, Russia Launch Historic One-Year Space Mission. 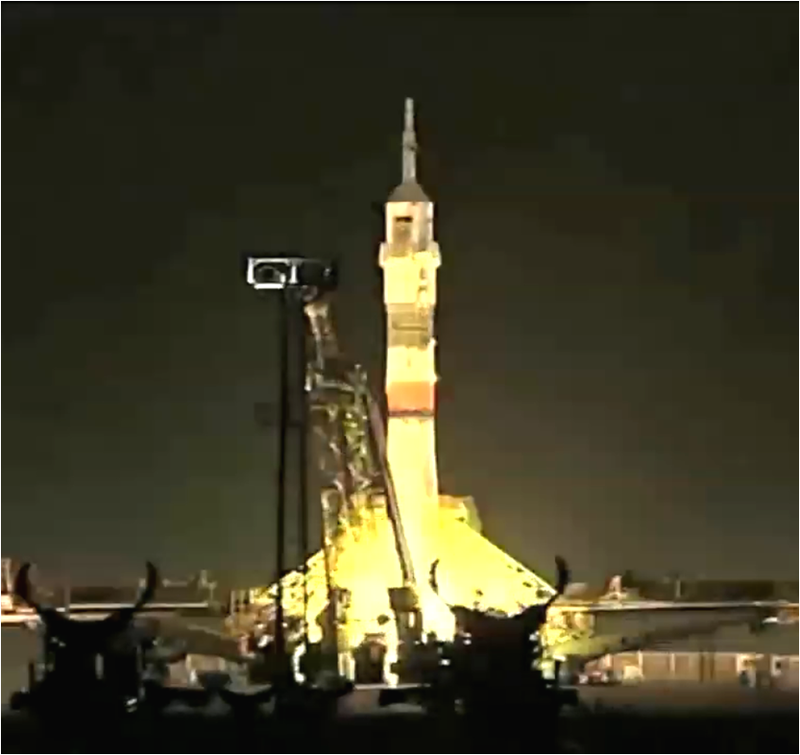 “An unprecedented one-year mission to the International Space Station [began] Friday (March 27). NASA astronaut Scott Kelly and Russian cosmonaut Mikhail Kornienko [did] launch toward the orbiting lab aboard a Russian Soyuz capsule, at 3:42 p.m. EDT (1942 GMT), from Baikonur Cosmodrome in Kazakshtan.” According to NASA, “…a crewed Mars mission could take 500 days or more; learning more about the potential problems astronauts could experience during a long mission is important [for planning future missions to the Red Planet]…” See The Yearlong Space Station Mission: Full Coverage. Below, Mars One introduction film (plus many other related videos). Dynamic evolutionary change in post-Paleozoic echinoids and the importance of scale when interpreting changes in rates of evolution PNAS. From the cover of the Proceedings of the National Academy of Sciences. Authors Melanie J. Hopkins and Andrew B. Smith provide “…an example of a 265 million-year-old marine invertebrate [sea urchin] clade where evolutionary rates show a net increase over time. This is punctuated by intervals of high rates of morphological evolution, coinciding with major shifts in lifestyle and the evolution of new subclades. The study demonstrates the dynamic nature of evolutionary change within major clades.” For complete study go to PNAS. Debate over Kin Selection generates yet another response to the controversial 2010-Nature article authored by Martin A. Nowak, Corina E. Tarnita & Edward O. Wilson. The new critique was published in PLoS Biology. The latest rebuttal to the Nowak et al. (2010) article is titled “Relatedness, Conflict, and the Evolution of Eusociality,” authored by X. Liao, S. Rong & D. C Queller. The researchers summarize their work [a theoretical mathematical model] as follows: “The evolution of sterile worker castes in social insects has fascinated biologists ever since Darwin; how can selection favor a trait that decreases reproductive fitness? 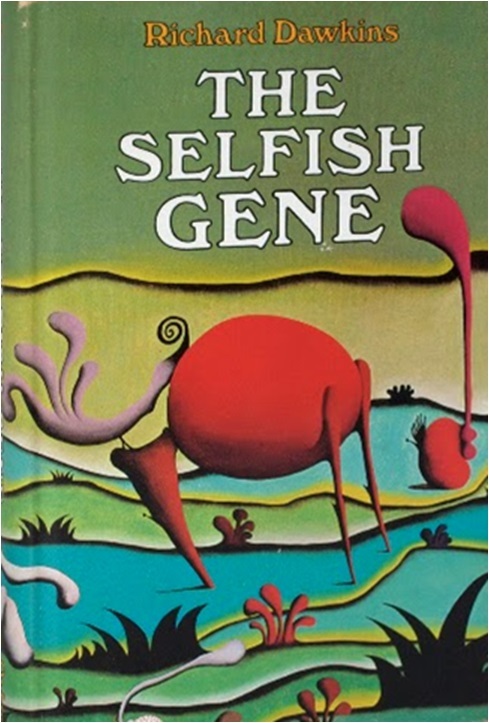 W. D. Hamilton solved this dilemma in the 1960s with a theory showing that reproductive altruism could evolve if it increased the worker’s inclusive fitness, which included effects that it had on increasing the fitness of its relatives. This solution to a crucial evolutionary problem, sometimes called kin selection, was challenged in a recent paper (Nowak et al. 2010). The paper generated much controversy, but no one has contested its new theoretical model of the evolution of eusociality, which appeared to overturn much of what was previously thought to be true from kin selection theory. Here we [Liao et al. 2015] examine this model in greater depth, showing that its apparently novel conclusions are overgeneralized from narrow and often inappropriate assumptions. Instead, this modeling strategy yields results that confirm important insights from kin selection and inclusive fitness, such as the importance of relatedness and the existence of conflicts in social insect colonies.” For complete open access to article go to PLoS Biology. Learn more about the kin selection debate in Op Piece “Dehumanizing Academia by Dismantling the Humanities,” including the crossfire between Richard Dawkins and Edward O. Wilson. By Guillermo Paz-y-Miño-C PhD — © 2015 with updates during 2016, 2017. 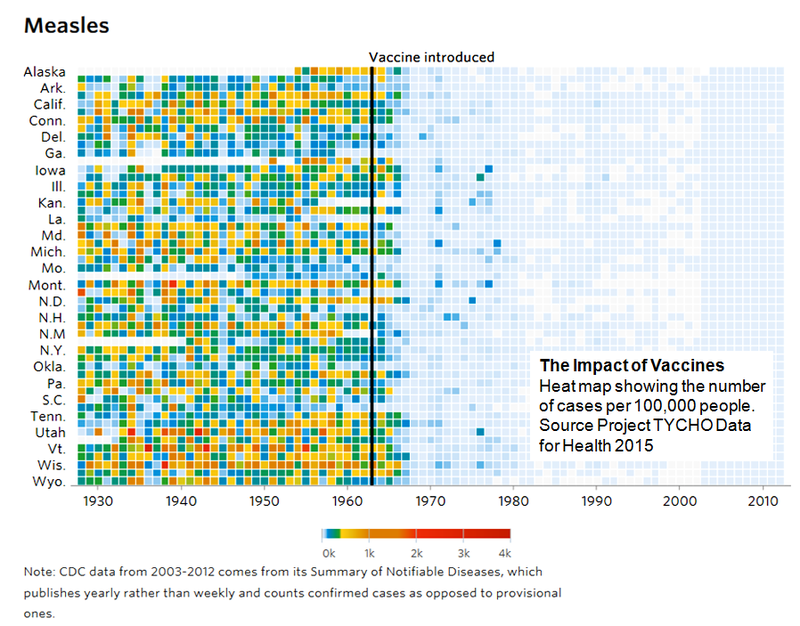 Anti-vaccination views can spread quite infectiously in society, mimicking the contagious nature of pathogens. But a “culturally immune” community —here I mean aware of the fundamentals about how vaccines work— can remain forever-protected from, or, at least, resistant to antivaxxer-memes. The word meme itself passed around as a replicator among academics, it became highly scrutinized, as well as valued, and an entire field of study, memetics, was born in the 1980s. Sadly, by 2005, the Journal Memetics: Evolutionary Models of Information Transmission, the peer-reviewed forum for scholarly articles, published its last issue. JM became dormant more than extinct. The metaphorical merit of the meme concept was both its major strength (for suggesting a didactic model to explain cultural information copying from one mind to another) and weakness (for not attaining consensus in the scientific community due to its subjectivity and the challenge to measure it). However, Dawkins and later “memeticists” (specialists in memetics) did manage to keep alive the meme debate for decades, and there is no indication that the meme hypothesis is irrelevant to modern science. After all, “cultural entities” are certainly hosted in brains, mimicked, subject to variation, competition for survival, and inheritance. Good, with-adaptive-value memes stick around, bad ones are prone to vanishing, but not without first instigating considerable damage. But, let us go back to antivaccination memes and their harmful makeup. 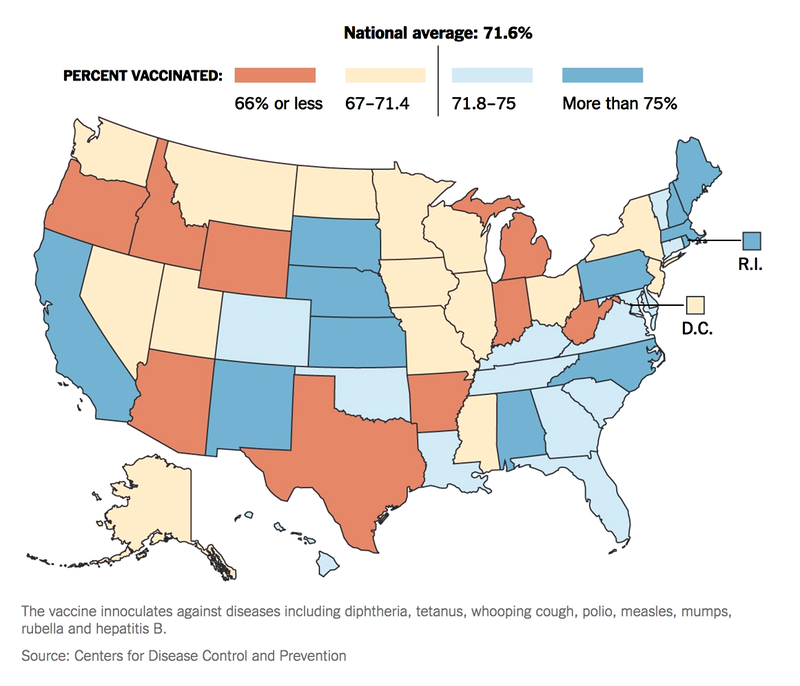 As long as the number of vaccinated individuals in a population overwhelms the amount of unvaccinated, the “herd-immunity effect” will continue to protect those who have not yet developed defenses. The rule is mathematically simple: the probability of infection —and death— increases when the number of unvaccinated people augments. 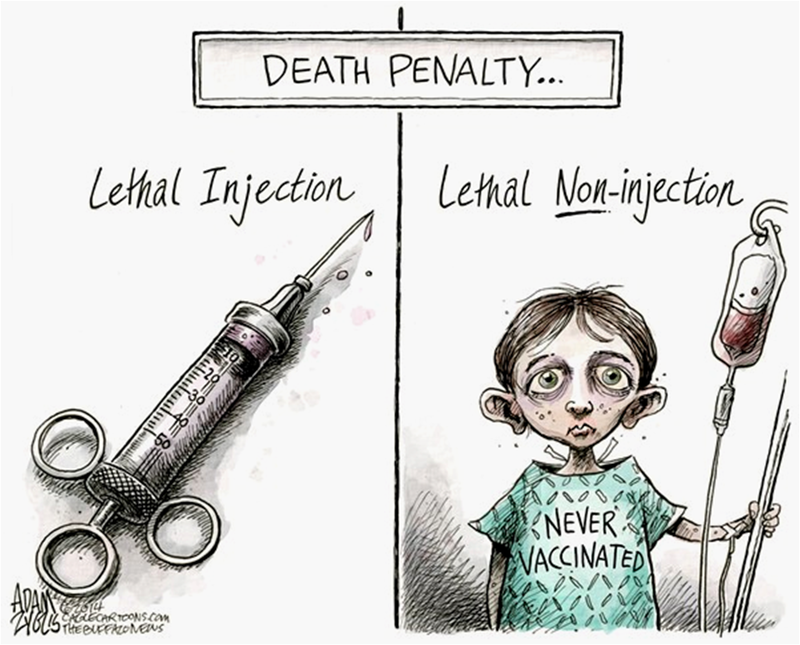 In fact, those lacking vaccine-induced immunity to smallpox, rubella, polio, pertussis, mumps, measles or diphtheria can “free-ride” in society only when the vast majority of the population has been vaccinated at an average rate of 83-88 percent, depending on the disease. That is perhaps all a nation needs to understand to get the shots! 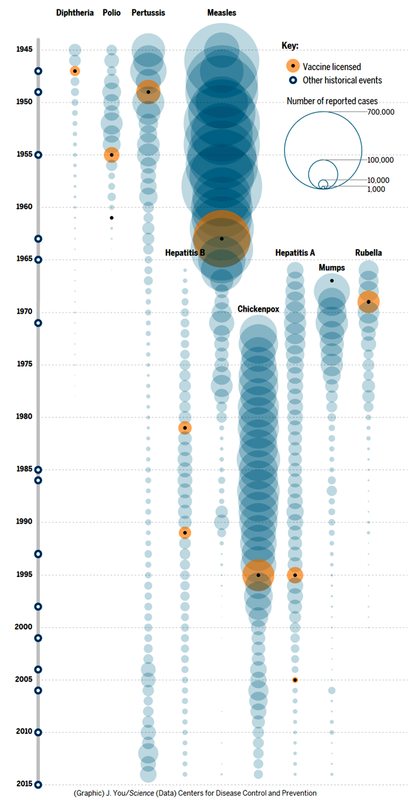 But if the “public good” argument is no antidote for antivaxxer-poison, here I offer a single, yet historically gruesome example that illustrates why vaccinations have become required in many countries: smallpox, the sole predator of 300 to 500 million people during the 20th century, and possibly of 20 million North-, Central- and South-American natives after the Europeans’ arrived —from the Caribbean— in the 1520s. Smallpox is caused by the variola virus, which transferred from wild or domesticated animals to Sub-Saharan humans, at least 3,000 years ago. Variola behaves like a “hit and run” pathogen, incessantly moving to the next target. Once it enters via inhalation the airway passages of the host’s lungs, it incubates for one or two weeks in lymphatic ganglia and disseminates to multiple organs. The patient becomes symptomatic when lacerations or blisters appear in the skin and endothelial membranes (inside the mouth, nose and throat), combined with fatigue, fever, forehead ache, overall muscle soreness and joint pain, nausea and vomiting. Ineffective immune response leads to death in 1-2 days. 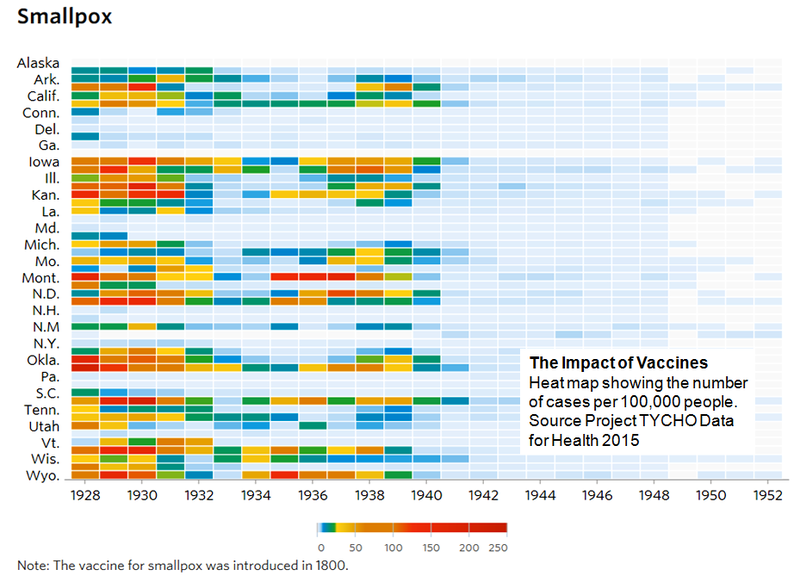 Smallpox is fatal in up to 30 percent of cases. The key point is that when the virus runs out of “fresh prey,” it dies out, and this makes it vulnerable to vaccines. Via safe inoculations of laboratory-engineered-strains of the virus, scientists can “trick” the immune system to generate antibodies against variola. Relying on this procedure, smallpox was eradicated in the late 1970s. 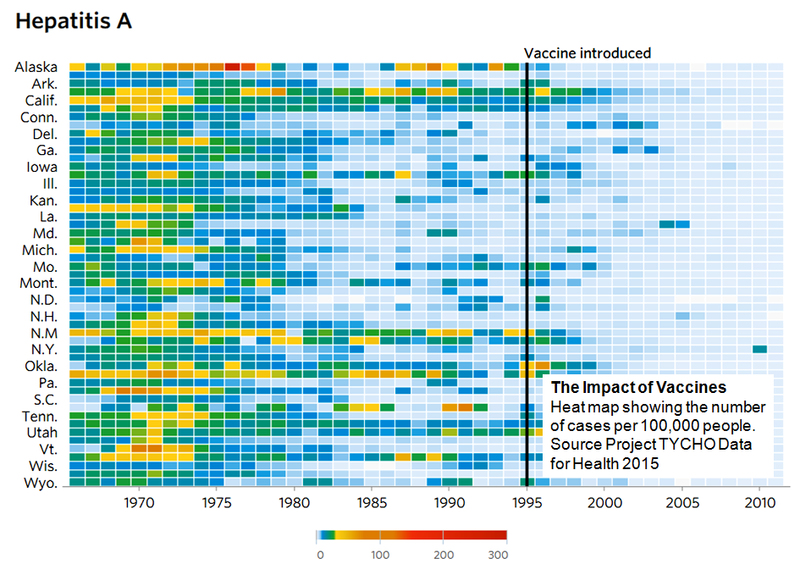 And by vaccinating most infants, in urban and rural areas worldwide, we all gradually built the herd-immunity effect on which the unvaccinated can freely —but unsafely— ride. 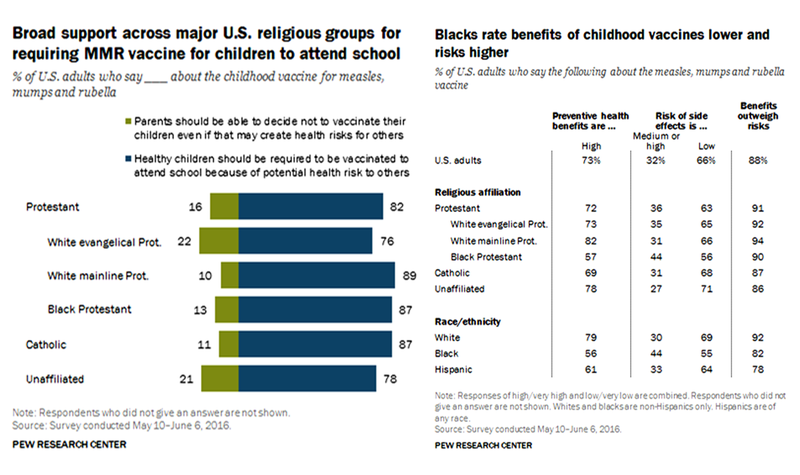 It is a risky bet, of course, to attempt to replicate the antivaxxer-meme and infect the populous with the reckless notion that we should refuse, as a matter of self-determination and individual freedom principles, to “put unnatural substances in our bodies,” or, worse, continue to link vaccinations to “mental retardation and autism in children,” a fabricated story long ago debunked by science (links to references provided below). 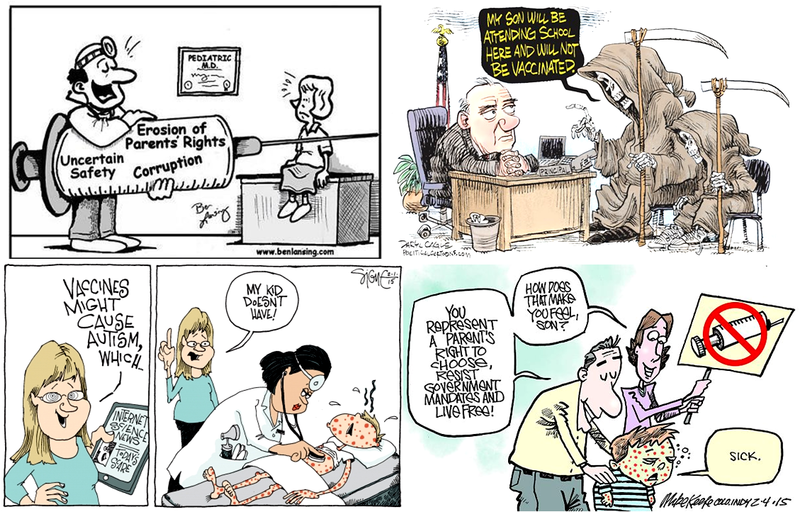 Although non-adaptive memes are destined to disappear in the milieu of great-versus-wicked ideas, the human cost, in health and lives, during the path to eradicating the anti-vaccination movement, will be regrettably painful. Still new diseases will emerge in the future, old ones resurrect, while competent physicians try to manage them in crowded environments. But the anti-science gang will only succumb to a robust “educated-public-herd effect.” — © 2015 by EvoLiteracy, with updates during 2016 and 2017, all rights reserved. The State of Vaccine Confidence 2016: Global Insights Through a 67-Country Survey, see also a commentary about this article in Science. 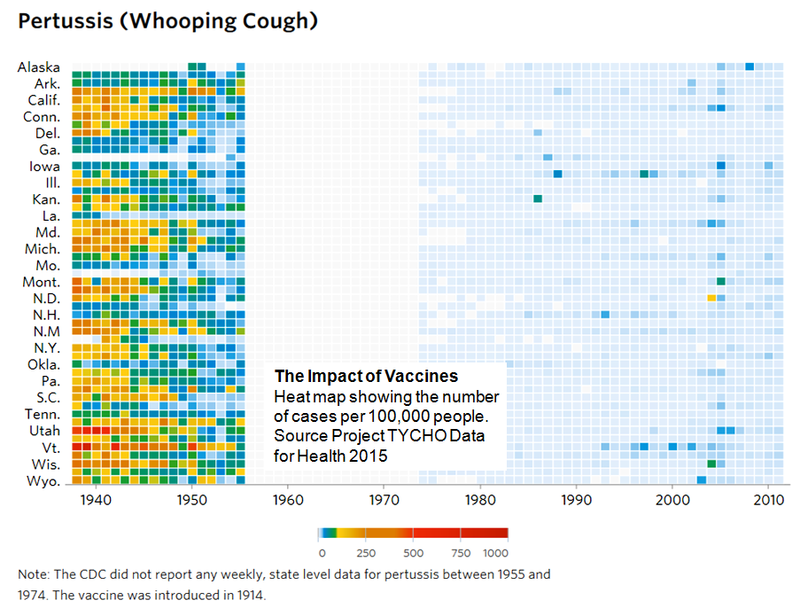 And on the same topic: The Vaccine Wars: Debunking myths, owning real risks, and courting doubters from Science. 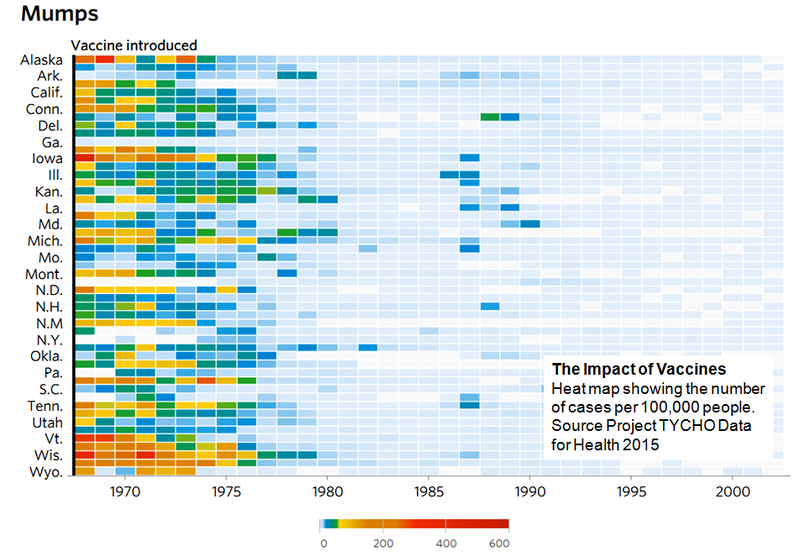 Jain A, Marshall J, Buikema A, Bancroft T, Kelly JP, Newschaffer CJ (2015) Autism occurrence by MMR vaccine status among US children with older siblings with and without autism. JAMA 313(15): 1534–40. doi: 10.1001/jama.2015.3077. pmid:25898051. Uno Y, Uchiyama T, Kurosawa M, Aleksic B, Ozaki N (2015) Early exposure to the combined measles-mumps-rubella vaccine and thimerosal-containing vaccines and risk of autism spectrum disorder. Vaccine 33(21): 2511–6. doi: 10.1016/j.vaccine.2014.12.036. pmid:25562790. Taylor LE, Swerdfeger AL, Eslick GD (2014) Vaccines are not associated with autism: an evidence-based meta-analysis of case-control and cohort studies. Vaccine 32(29): 3623–9. doi: 10.1016/j.vaccine.2014.04.085. pmid:24814559. 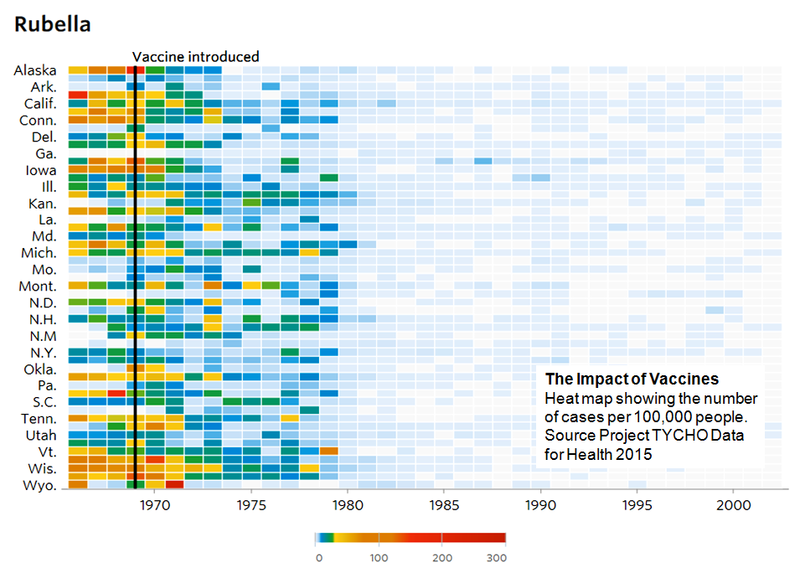 Zerbo O, Qian Y, Yoshida C, Fireman BH, Klein NP, Croen LA (2017) Association Between Influenza Infection and Vaccination During Pregnancy and Risk of Autism Spectrum Disorder. JAMA Pediatr 171(1): e163609. doi: 10.1001/jamapediatrics.2016.3609. Gadad BS, Li W, Yazdani U, Grady S, Johnson T, Hammond J, Gunn H, Curtis B, English C, Yutuc V, Ferrier C, Sackett GP, Marti CN, Young K, Hewitson L, German DC (2015). Administration ofthimerosal-containing vaccines to infant rhesus macaques does not result in autism-like behavior or neuropathology. Proc Natl Acad Sci U S A. 112(40): 12498-503. Stoner R, Chow ML, Boyle MP, Sunkin SM, Mouton PR, Roy S, Wynshaw-Boris A, Colamarino SA, Lein ES, Courchesne (2014). Patches of disorganization in the neocortex of children with autism. N Engl J Med. 370(13): 1209-19. doi: 10.1056/NEJMoa1307491. Memetics publications on the web. Autism’s fight for facts: A voice for science. Convinced by the evidence that vaccines do not cause autism, Alison Singer started a research foundation that pledges to put science first. Nature 479, 28-30 ( 02 November 2011 ). CDC AUTISM SPECTRUM DISORDER. Autism spectrum disorder (ASD) is a group of developmental disabilities that can cause significant social, communication and behavioral challenges. CDC is committed to continuing to provide essential data on ASD, search for factors that put children at risk for ASD and possible causes, and develop resources that help identify children with ASD as early as possible. Learn about the latest Ebola research in Science Magazine. 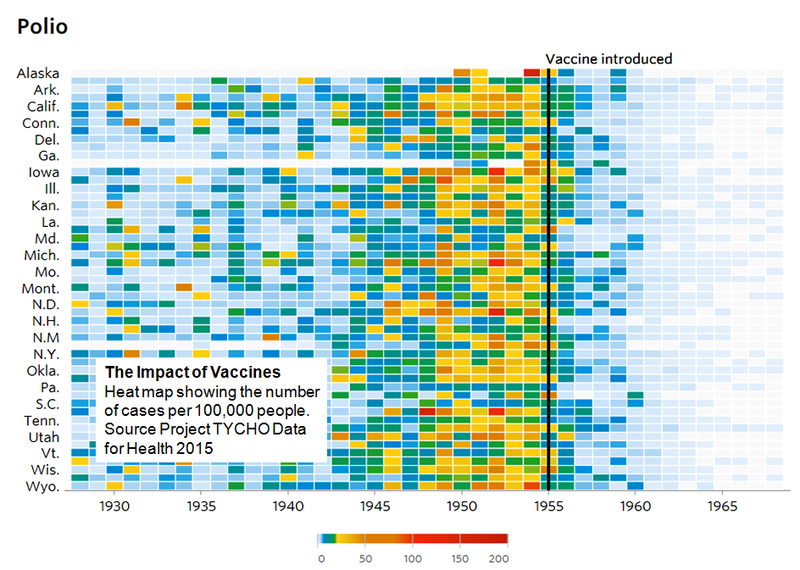 Reduced vaccination and the risk of measles and other childhood infections post-Ebola, also in Science Magazine. New species of frog can rapidly change skin texture from smooth to spiny. The “mutable rainfrog” (Pristimantis mutabilis), discovered in Ecuador, is not only cute but scientifically intriguing. The new amphibian species was discovered in the humid, mossy cloud forest habitat in Ecuador’s Reserva Las Gralarias, in the Andes. The study was just published in the Zoological Journal of the Linnean Society. The authors, Juan M. Guayasamin and four other collaborators, describe a “striking case of phenotypic plasticity” (= the frog overall appearance) in which the anuran has the ability to modify its skin texture within minutes, changing between two discrete character states: from presence to absence of tubercles. Interestingly, the “mutable frog” [note that the authors use this term to advertise the fast switch from one appearance to another] is not the only species with this trait; the biologists also describe a second sympatric frog (P. sobetes) with comparable characteristics. It is not clear, however, why these frogs can morpho-change their appearance, although environmental factors –including camouflage (the hypothesis favored by the authors since specimens resemble the mossy habitat in which they live), predators, sexual selection or an anatomical/physiological adaptation to the role of the skin in the animals’ biology– often shape the phenotype. The authors speculate that the so quick changes in the skin appearance “could involve allocation of more or less water to existing small structures (e.g. warts and tubercles),” but it is obvious that the process is not fully understood. Guayasamin and coauthors describe that “individuals of Pristimantis mutabilis presented a markedly tubercular skin texture when found on vegetation or hidden in moss during the night. Large tubercles were evident on the dorsum, upper and lower lips, upper eyelid, arms and legs.” And they add: “After frogs were captured, they all showed a sudden and drastic change in skin texture; all tubercles became reduced in size.” Amazing, indeed! For journalistic information on this story go to amphibians.org. Amphibian was top predator. A species of crocodile-like amphibian was among Earth’s top predators more than 200 million years ago. The University of Edinburg. The research was just published in the Journal of Vertebrate Paleontology. as A new species of Metoposaurus from the Late Triassic of Portugal and comments on the systematics and biogeography of metoposaurid temnospondyls. Brusatte et al. write in the summary of their research “Metoposaurids are a group of temnospondyl amphibians that filled crocodile-like predatory niches in fluvial and lacustrine environments during the Late Triassic. Metoposaurids are common in the Upper Triassic sediments of North Africa, Europe, India, and North America… We here erect Metoposaurus algarvensis, sp. nov., the first Metoposaurus species from the Iberian Peninsula, based on several new specimens from a Late Triassic bonebed in Algarve, southern Portugal… The new Portuguese bonebed provides further evidence that metoposaurids congregated in fluvial and lacustrine settings across their geographic range and often succumbed to mass death events…” For complete article go to Journal of Vertebrate Paleontology. EvoLiteracy Photos: click on image below to visit Evolution Literacy Photos – Wildlife – Fossils – Landscapes – Museums – Monuments – Cities. 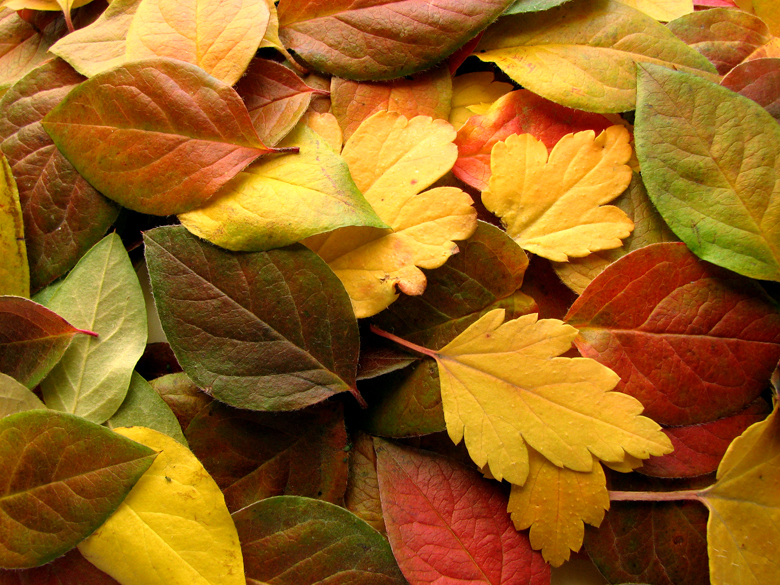 Is Autumn the neglected season in climate change research? Researchers at Boston University and the University of Connecticut think so! (03 2015). 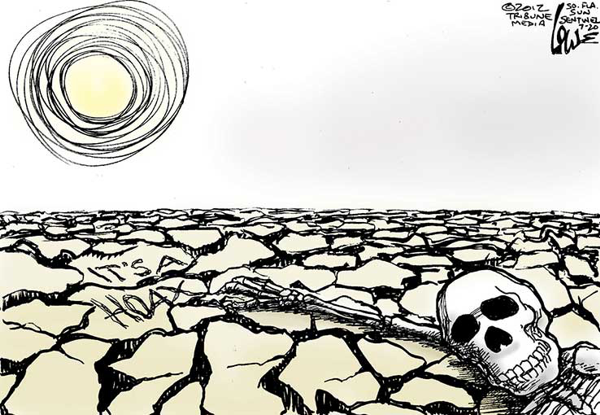 “…This neglect occurs despite the importance of autumn events, including leaf senescence, fruit ripening, bird and insect migration, and induction of hibernation and diapause. Changes in autumn phenology alter the reproductive capacity of individuals, exacerbate invasions, allow pathogen amplification and higher disease-transmission rates, reshuffle natural enemy–prey dynamics, shift the ecological dynamics among interacting species, and affect the net productivity of ecosystems…” The review article was published in the March issue of Trends in Ecology & Evolution Vol. 30 (3). Coral-reef fish changes color to imitate other species and eat their progeny. Study just published in Current Biology (03 19 2015). Researchers at the University of Cambridge have reported that “The dottyback changes its colour to match surrounding damselfish species, enabling it to counter the defences of its damselfish prey by disguising itself as a harmless part of their community, then swoop in to hunt their young… By changing colour to imitate local damselfish communities, dottybacks are able to overcome the predator avoidance behaviour in the juvenile fish they hunt.” Watch graphical abstract of research at Current Biology: Phenotypic Plasticity Confers Multiple Fitness Benefits to a Mimic. Is the Human chin –its unique shape among the apes and other primates– an adaptation for chewing stress, speech, or a sexual ornament? Are chins spandrels —byproducts of selection operating elsewhere in the mandible or face? Are chins the product of genetic drift (some inbreeding among ancestral humans)? (03 17 2015). The Journal of Human Evolution has an article addressing theses questions. The findings can be summarized as follows: “Quantitative measures that capture the degree of chin expression were gathered from a sample of 123 primate taxa, and evolutionary rates associated with these measures were reconstructed in the primate phylogeny. The evolutionary rate associated with these measures was reconstructed to be far higher along the Homo tip (∼77 times greater than the primate background rate of evolution) than elsewhere in the primate phylogeny.” The results suggest that the human-chin morphology is an exceptionally derived trait relative to other primates and a product of selection. — Note: the large chin in actor Richard Kiel was actually product of a syndrome called acromegaly. Golden retrievers genetically predisposed to cancer. Research has applications to understanding human cancer. From the cover of PLoS Genetics (02 02 2015). PLoS Genetics summarizes Tonomura et al.’s work as follows: “Dogs are not only ‘man’s best friend’ for their loyalty, they are also the geneticist’s best friend. The artificial breed structure has created genetically isolated groups of dogs, with differential predisposition to diseases they share with us. This facilitates mapping of diseases relevant also to humans. 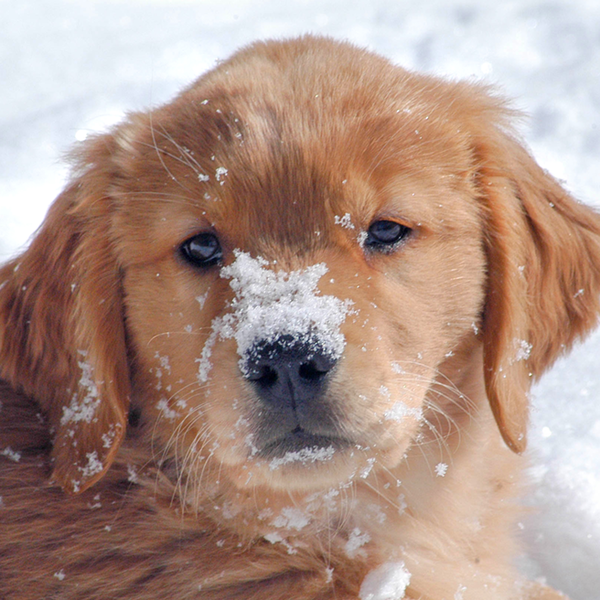 Golden retrievers are predisposed to various cancers, including B-cell lymphoma and hemangiosarcoma. The genetic risk factors for these diseases in humans are still being elucidated. Surprisingly, golden retrievers have two nearby genetic loci with haplotypes predisposing to both diseases.” The complete article is available open access at PLoS Genetics. US Senator Ted Cruz Distorts NASA’s Mission Budget. This report, appeared first in FactCheck.org and refers to Republican Senator Ted Cruz, who chairs the Senate Subcommittee on Space, Science, and Competitiveness (03 18 2015). FactCheck.Org summarizes both Sen. Cruz remarks vs. NASA’s mission and vision: Sen. Cruz, March 12, 2015: As we begin the process of putting together a roadmap for the future of NASA, there is one vital question that this committee should examine: Should NASA focus primarily inwards, or outwards beyond lower Earth orbit. Since the end of the last administration we have seen a disproportionate increase in the amount of federal funds that have been allocated to the earth science program at the expense of and in comparison to exploration and space operations, planetary science, heliophysics and astrophysics, which I believe are all rooted in exploration and should be central to the core mission of NASA. … I am concerned that NASA in the current environment has lost its full focus on that core mission. NASA, 1964: The fundamental objective of the Geophysics and Astronomy Program is to increase our knowledge and understanding of the space environment of the Earth, the Sun and its relationships to the Earth, the geodetic properties of the Earth, and the fundamental physical nature of the Universe. Knowledge of these areas is basic, not only to our understanding of the problems of survival and navigation in space, but also to the improvement of our ability to make technological advances in other fields. 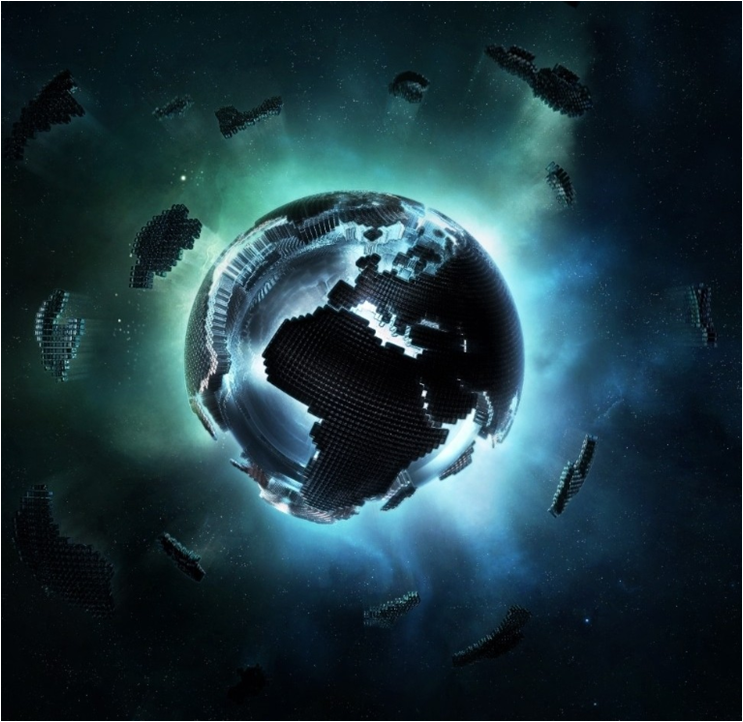 The understanding of the Earth’s atmosphere is important for advancement of weather forecasting, for solution of spacecraft reentry problems and for study of the atmospheres of other planets. For complete report go to FactCheck.org Cruz Distorts NASA’s Mission, Budget. Extraordinary diversity of visual opsin genes in dragonflies. This article was just published and featured on the cover of the Proceedings of the National Academy of Sciences (03 17 2015). The authors highlight the significance of their study as follows: “Human color vision is tri-chromatic, with three opsins expressed in cone photoreceptors that are sensitive in the red, green, and blue region of the spectrum. As theories predict, such tri- or tetra-chromacy with three or four opsin genes is common among mammals, birds, and other animals, including insects. However, we discovered that dragonflies possess as many as 15–33 opsin genes that have evolved through dynamic gene multiplications and losses within the lineage of dragonflies. These opsin genes are differentially expressed between adult and larva, as well as between dorsal and ventral regions of adult compound eyes, which plausibly underpin the versatile behavioral and ecological adaptations of actively flying adults to aerial lifestyle and sedentary larvae to aquatic lifestyle.” See source PNAS Vol. 112 (11). UK mapped out by genetic ancestry. Finest-scale DNA survey of any country reveals historical migrations (03 18 2015). A map of the United Kingdom shows how individuals cluster based on their genetics, with a striking relationship to the geography of the country. Source Stephen Leslie, Nature Magazine. “The analysis — which shows a snapshot of clusters of genetic variation in the late 1800s, when people were less likely to migrate far from their region of birth — reflects historical waves of migration by different populations into the island… [A] statistical model lumped participants into 17 groups based only on their DNA, and these groupings matched geography. People across central and southern England fell into the largest group, but many groupings were more isolated, such as the split between Devonians and Cornish in Britain’s southwest. People who trace their ancestry to the Orkney Islands, off the northeast coast of Scotland, fell into three distinct categories.” Source Nature http://dx.doi.org/10.1038/nature14230. Darwin’s puzzle… again evolution was, is true. Ancient proteins resolve the evolutionary history of some South American ungulates. Camel or elephant? 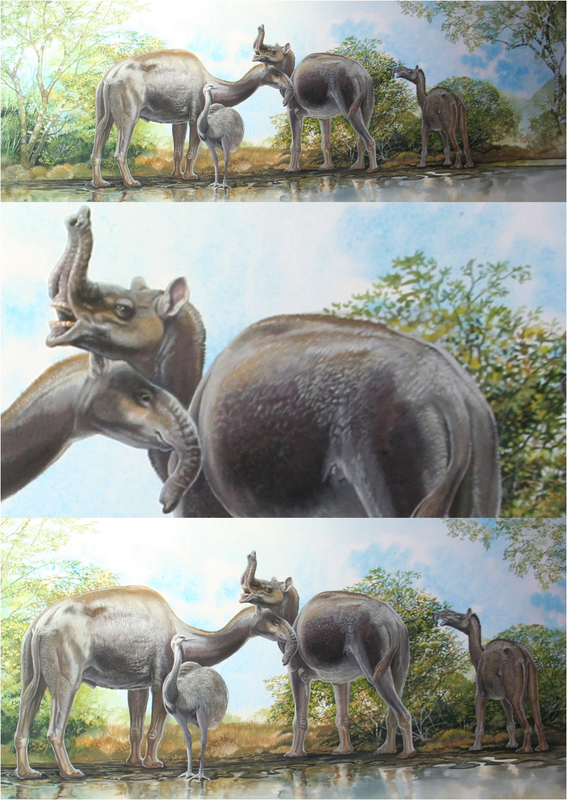 Actually, this extinct South American mammal called Macrauchenia is most closely related to horses! (03 18 2015). 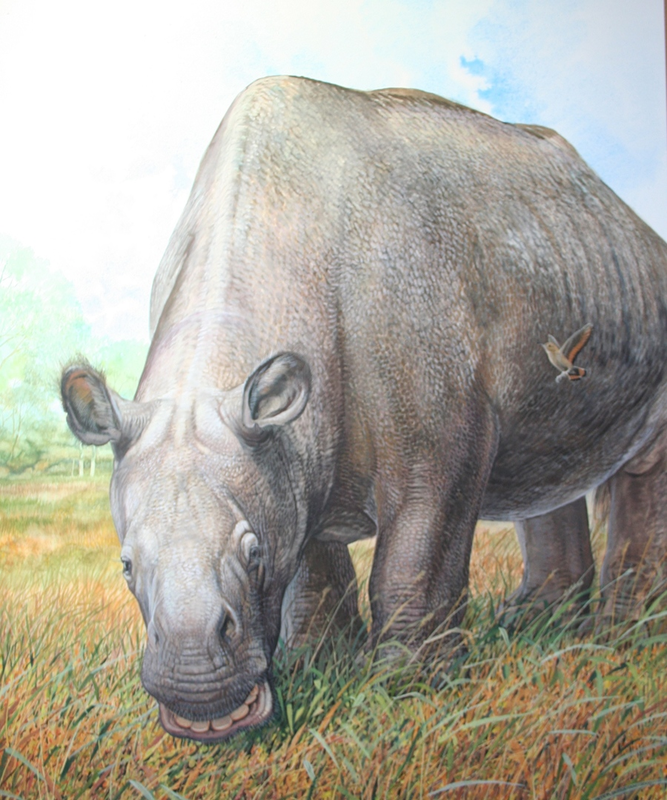 The study was published in the journal Nature: “…Toxodon and Macrauchenia form a monophyletic group whose sister taxon is not Afrotheria or any of its constituent clades as recently claimed, but instead crown Perissodactyla (horses, tapirs, and rhinoceroses). These results are consistent with the origin of at least some South American native ungulates from ‘condylarths’, a paraphyletic assembly of archaic placentals. With ongoing improvements in instrumentation and analytical procedures, proteomics may produce a revolution in systematics such as that achieved by genomics, but with the possibility of reaching much further back in time.” See source Nature doi:10.1038/nature14249. Charles Darwin‘s interest in traveling the world on board of the HMS Beagle (1831-1836), and subsequent visit to Ecuador’s Galapagos Islands, in 1835, was inspired by Berlinese Alexander Von Humboldt‘s Personal Narrative of Travels to the Equinoctial Regions of America (1799-1804), a recount of expeditions in pristine Neotropic landscapes –many in today’s Ecuador. 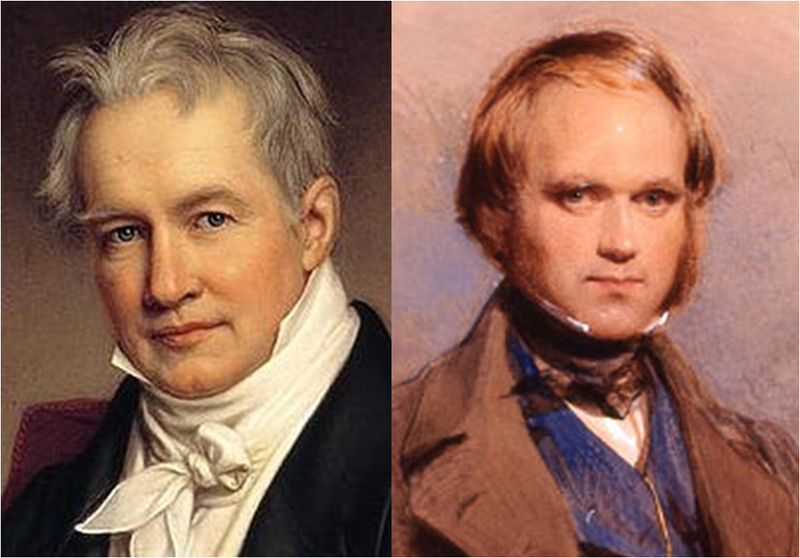 Alexander von Humboldt (1769-1859) and Charles Darwin (1809-1882), both at young age. “I formerly admired Humboldt, I now almost adore him; he alone gives any notion, of the feelings which are raised in the mind on first entering the Tropics…” Darwin wrote in 1832 in a letter to English botanist John Stevens Henslow. 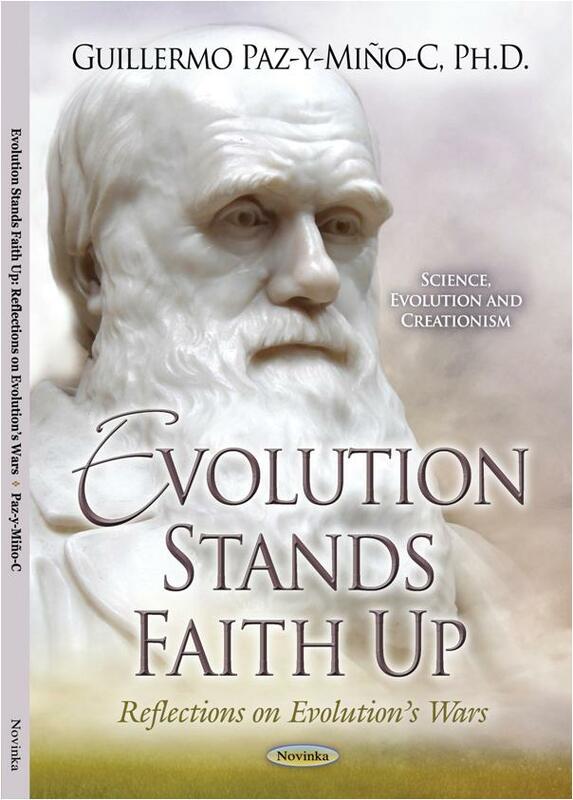 Almost three decades afterward, in 1859, Darwin‘s On the Origin of Species by Means of Natural Selection did forever-transform humanity’s understanding of Nature. His observations of the Galapagos finches, tortoises and marine iguanas, together with museum specimens he and others collected, became textbook exemplars of evolution. Humboldt‘s own adventurous traveling had been sparked by the French geographer Charles Marie de La Condamine, who, in the 1730s, led the geodesic mission to measure the length of a meridian arc at the equator, in present Ecuadorian Andes, and thus test Isaac Newton‘s postulate that the Earth, due to gravitational forces and its rotation at a stable angle in respect to an orbiting trajectory around the sun, should be an oblate spheroid flattened at the poles. By comparatively measuring the arc at the equator (La Condamine‘s team) and at the North Pole (another crew sponsored as well by the Paris Academy of Sciences), Newton‘s laws of motion and universal gravitation (published in Mathematical Principles of Natural Philosophy in 1687), were confirmed and the two-centuries ruling model of our planet’s elongation at the poles was debunked. A major scientific paradigm shift in which the location of a field site, the to-be Ecuador, played a critical role, as well as the involvement in the expedition of local cartographer Pedro Vicente Maldonado. Motion of Sun, Earth, and Mars according to heliocentrism (left) and to geocentrism (right), before the Copernican-Galilean-Newtonian revolution. Note the retrograde motion of Mars on the right. Yellow dot, Sun; blue, Earth; red, Mars. (In order to get a smooth animation, it is assumed that the period of revolution of Mars is exactly 2 years, instead of the actual value, 1.88 years). The orbits are assumed to be circular, in the heliocentric case. Click on Image for SOURCE. But this intertwined history of fascinating events gets even richer: the Newtonian proposal was rooted in Nicolaus Copernicus (1543) heliocentric hypothesis (= the sun as center of our solar system), confirmed by Galileo Galilei and Johannes Kepler, iconic figures in the astronomy of the 1600s and prior debunkers of the geocentric, creationist view (= the Earth as center of the universe). Another impactful scientific paradigm shift! Thus, in hindsight, Ecuador’s geography and unique species richness have long been linked –and not coincidentally— to the very roots of modern science: from the Copernican revolution of the 1500s to the Darwinian revolution of the 1800s. This connection was possible due to the partaking of the Ecuadorian people in the success of so many expeditions to the New World led by naturalists and explorers, who ventured into Ecuador’s glaciers, the Amazon, the wet- and arid-coasts, and the “enchanted” Galapagos Islands. 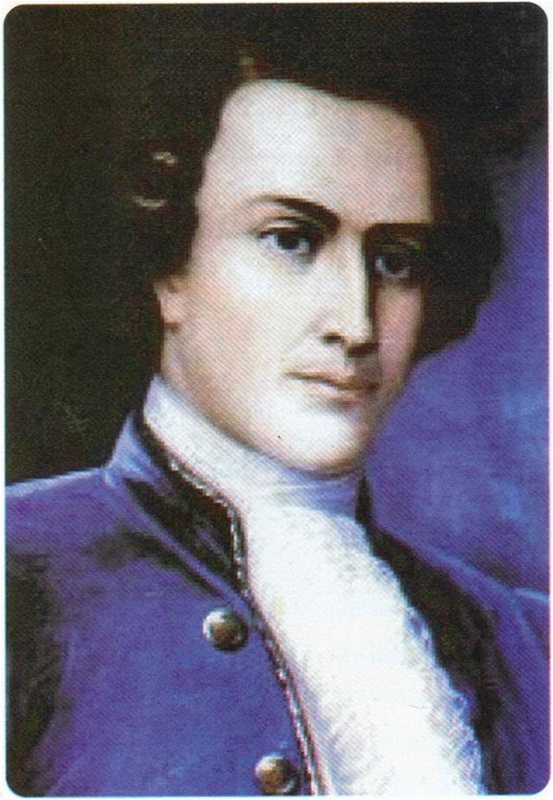 Ecuadorian Geographer Pedro Vicente Maldonado (1704-1748). In 1736, he collaborated with the French Geodesic Mission. Proud of such privileged heritage, the Ecuadorian scientists officially launched, only two years ago, on February 2013, their own Academy of Sciences. Although later than their counterpart Academies in the Americas, the Ecuadorians joined, as per July 2013, the Inter-American Network of Academies of Sciences (IANAS), and did it with historically distinctive credentials and originality: In the past two decades alone, Ecuador’s universities have hosted three world Evolution Summits in the Galapagos, sponsored field-research stations at the megadiverse Amazonian rainforests (Cuyabeno, Yasuní and Tiputini), led top executive positions at influential world conservation organizations (International Union for Conservation of Nature and World Wildlife Fund), and contributed to raise global awareness about the value of the indigenous peoples’ cultures and their impressive knowledge of the environment (fourteen distinctive ethno-nationalities coexist within a total population of 15 million). A remarkable vitae, indeed, for one of the small-sized countries in South America (284,000 square kilometers). Induction Ceremony of ACE, Quito. Top: Dr. Carlos Soria, President of ACE; Dr. Michael Clegg Co-Chair IANAS; Ec. René Ramírez, General Secretary SENESCYT; Dr. Jaime Medina, Undersecretary of Innovation Science and Technology at SENESCYT; Dr. Santiago Ron, Secretary ACE. Middle: Dr. Carlos Soria and Dr. Michael Clegg. Bottom: audience. And, just a few days ago, on February 19, 2015, ACE inducted twenty five new members –from ten different universities— to the Academy, which now consists of thirty one scholars, including six founders. President of ACE, Dr. Carlos A. Soria, Professor of Biochemistry at the Pontifical Catholic University of Ecuador, noted at the Induction Ceremony –held at the Eugenio Espejo Convention Center in Quito— that the Academy will continue to elect, as members, researchers in the life, earth, chemistry, exact and social sciences. 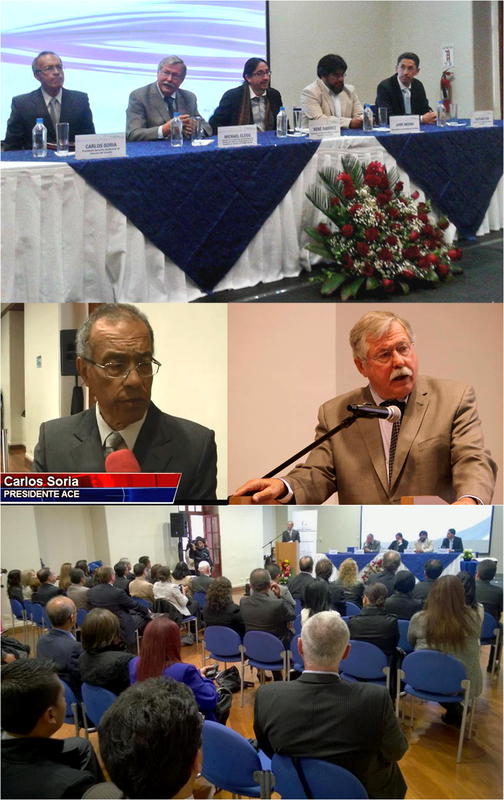 Dr. Soria remarked that ACE‘s broad purpose is to promote and disseminate research, facilitate the exchange of scientific information and technologies among partner institutions, sponsor professional development of researchers, and provide technical advice –upon solicitation— to the government and private sector. He drew attention to the significance of the applied sciences for the improvement of the quality of life, treatment of infectious diseases, like Ebola or malaria, and for addressing the challenges of air, soil and water pollution, or the sequels of climate change that, in the case of Ecuador, will affect its fragile ecosystems and biodiversity. His speech was an assertive, yet a gentle plea to attain support for the advancement of science, specifically from the government officials who attended the Ceremony. In fact, economist René Ramírez, General Secretary of Education, Science, Technology and Innovation (SENESCYT) and Dr. Jaime Medina, the Undersecretary of Innovation Science and Technology at SENESCYT, listened carefully to ACE’s President’s statement. In an extensive, multi-topic assessment of the status of science and technology in Ecuador, and the government’s commitment to finance research, Secretary Ramírez conveyed that SENESCYT will continue to support ACE, as it has since 2013, when, together with the National Secretariat for Planning and Development (SENPLADES), they recognized ACE as an official organization. The General Secretary emphasized the new regulations the government has introduced to improve the standards in higher education, accredit universities, validate degrees obtained overseas by Ecuadorian scientists, and strategically allocate funds for research and development. SENESCYT‘s intentions seemed sincere, but ACE will need long-term financial sponsors to sustain its presence in the country and abroad. Why are academies of sciences important? Why does Ecuador need ACE? These queries were addressed by Dr. Michael Clegg, Co-Chair of IANAS and representative of both the Global Network of Science Academies –or Inter Academy Partnership (IAP)— and US National Academy of Sciences (US-NAS). Dr. Clegg‘s address harmonized with Dr. Soria‘s by giving importance to the local, regional, national and international professional services that members of such prestigious organizations –the Academies— can provide to society at large. “Academies are merit based and represent the scientific leadership within a country… They are self renewing institutions, free from political interference, and have credibility to inform the public and policy makers about looming problems and potential solutions.” – Dr. Michael Clegg, Co-Chair IANAS. “Academies are merit based and represent the scientific leadership within a country,” stated Dr. Clegg, also a Professor Emeritus of Biological Sciences at the University of California – Irvine and member of the US-NAS. These organizations “are self renewing institutions, free from political interference, and have credibility to inform the public and policy makers about looming problems and potential solutions.” After all, “science is the world’s most successful means of knowledge creation, because it deals exclusively with arguments based on evidence, and with results that are subject to independent confirmation by others.” Dr. Clegg‘s remarks were both philosophically inspiring and practical; he aimed at supporting the mission and vision of ACE, as much as persuading SENESCYT‘s officials, and even perhaps the one hundred attendees to the Ceremony, that science is the best bet for solving development struggles and nourishing progress. As representative of IANAS, Dr. Clegg welcomed ACE to the network as one of its twenty two member organizations and he elaborated on IANAS’ programs in the Americas, to which ACE is already contributing: capacity building (strengthening science and technology in the region, creation of new Academies), energy (for underserved populations, renewable, bioenergy and efficiency), science education (networking, improvement of schooling standards, science communication and outreach), water (access to clean sources, decontamination, recycling and management of natural reservoirs), and women in science (action committees, increase participation, equality and leadership roles). Ecuador and ACE are in a unique position, regionally and internationally, to make a significant impact in the development of basic and applied research. 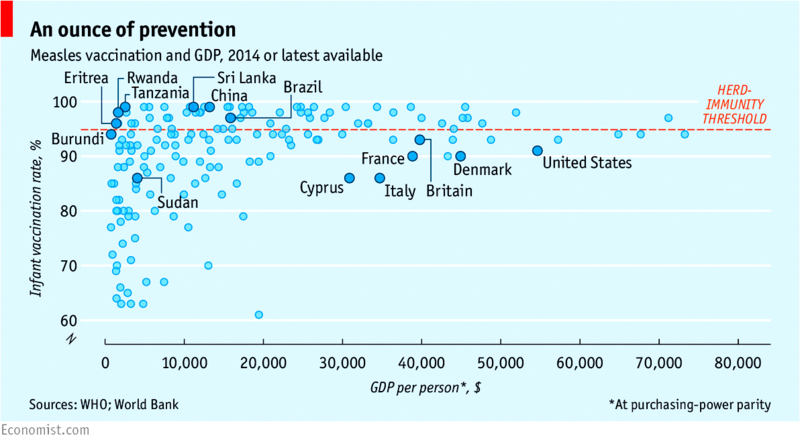 The government is investing 1.86% of its GDP in higher education and the number of PhDs in the university system, currently around 1,000, is expected to double within the next few years. The official recognition of ACE, both in Ecuador –by SENESCYT and SENPLADES— and in the world –by IANAS, IAP and US-NAS, adds formality to the country’s tradition of involvement in scientific endeavors. And there is much optimism, at home and abroad, for what this amazing nation can do with its brain power and new generations of young investigators. — © 2015 by Guillermo Paz-y-Miño-C. all rights reserved. Helferich, G. 2004. Humboldt’s Cosmos: Alexander von Humboldt and the Latin American journey that changed the way we see the world. New York, NY: Penguin Group. Montúfar, C. 2013. From Copernicus to Darwin (1473-1882). In: G.Trueba & C. Montúfar (Eds). Evolution From the Galapagos, Social and Ecological Interactions in the Galapagos. New York, NY: Springer Science Business Media. Paz-y-Miño-C, G & Espinosa, A. 2013. Galapagos III World Evolution Summit: Why Evolution Matters. Evolution: Education and Outreach 6: 28. Trueba, G. 2014. Why does evolution matter? The importance of understanding evolution. Cambridge UK: Cambridge Scholars.